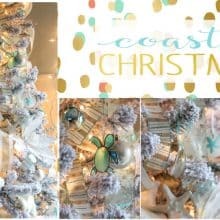 Coastal Christmas Tree (Aqua and White) and a blog hop! Aqua and White Coastal Christmas Tree and a Blog Hop! A special thanks to Michelle from Our Crafty Mom for organizing this amazing hop! For this Christmas tree blog hop, we’re showing you our aqua and white coastal Christmas tree. This little cutie sits on the recently refreshed stand in our mudroom. 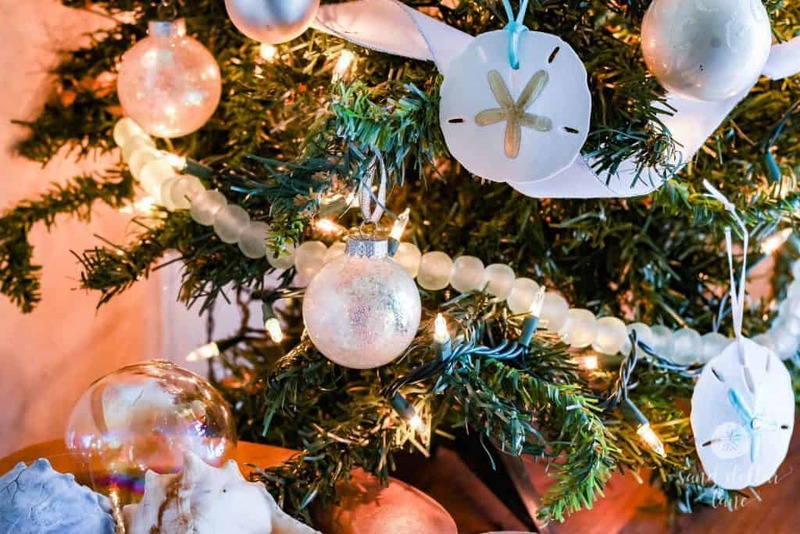 It’s a small tree but it’s covered in pretty, sparkly, beachy ornaments! 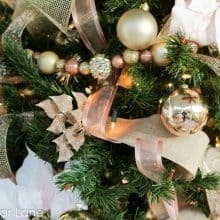 If you saw our rustic glam Christmas tree, you know that I love lots of ornaments on my trees. The first thing I added to this tree was three strings of our seaglass bead garlands. They look amazing with the twinkle lights shining through them! We added sand dollar ornaments with gold accents and some with aqua accents. I seriously can’t get enough of these cuties! I also included some ornaments Kortney and I made a few years ago. These were easy and fun to make. We just “drew” a design with glue then sprinkled glitter on it. Simple and so pretty! 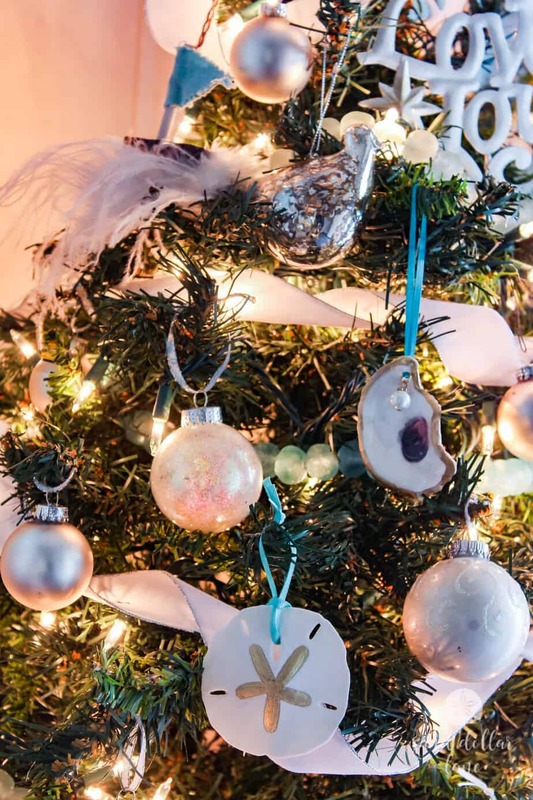 A few of our oyster shell ornaments made it on this tree too! I love the gold edging and the cute pearl on these! Mercury glass ornaments add a bit more bling and sparkle. Can’t have too much bling and sparkle this time of year! 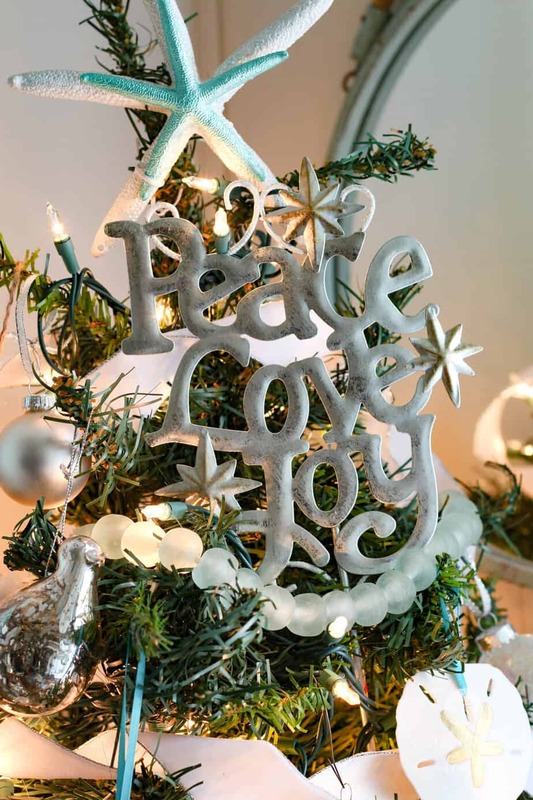 Most of the ornaments and garlands on this tree can be purchased in our shop. 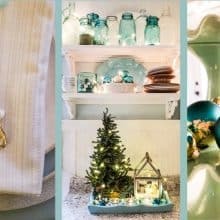 Later this week I will share with you the rest of the mudroom decorations and the larger coastal Christmas tree in my studio! 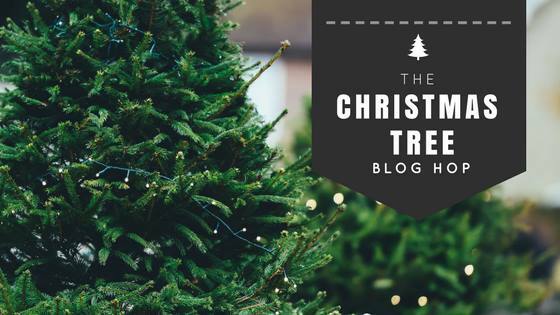 In the meantime, don’t miss out on the rest of the amazing bloggers featuring their Christmas trees today! Very cute! 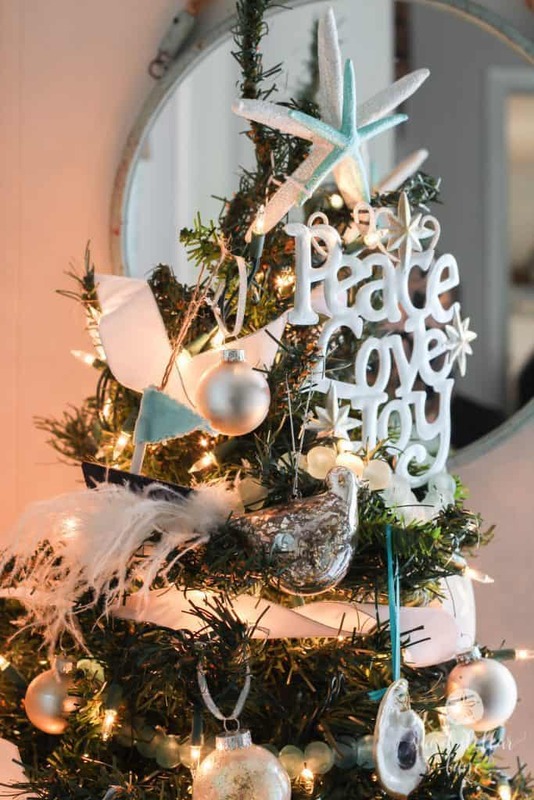 I like the tree topper that says “Peace love and joy” the best! Thanks for sharing in the blog hop! 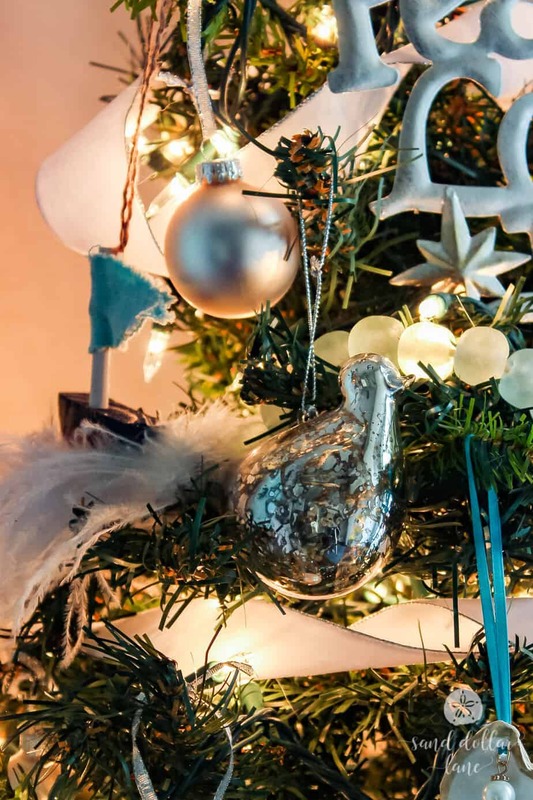 Love the mercury ornament you added to your beachy tree! Very cool! Enjoy the holidays with your family. Great meeting you at this blog hop. You have so many pretty coastal ornaments. The san dollars have my heart. Thanks for sharing ylur pretty tree. Beautiful! Since I’m near the Ocean and Chesapeake Bay, this speaks to me. Great job! 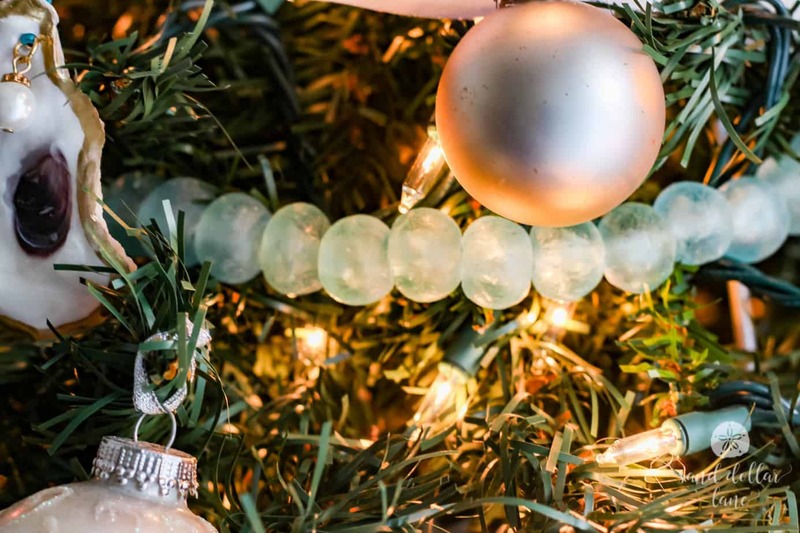 Your sea glass beads are certainly the highlight of your tree. They are gorgeous and so different. 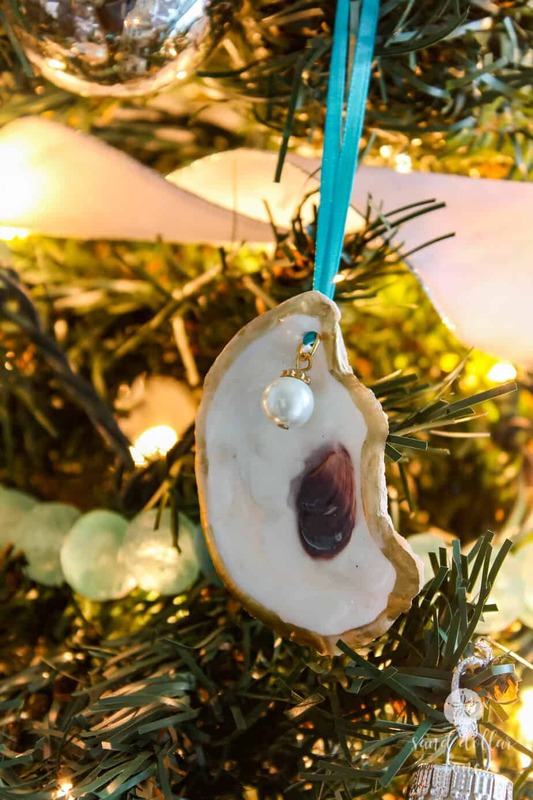 Love, love, love that oyster ornament! I think I just need one to hang around the house! Your tree is gorgeous! I LOVE this tree!!! Aqua is one of my favorite colors to decorate with. 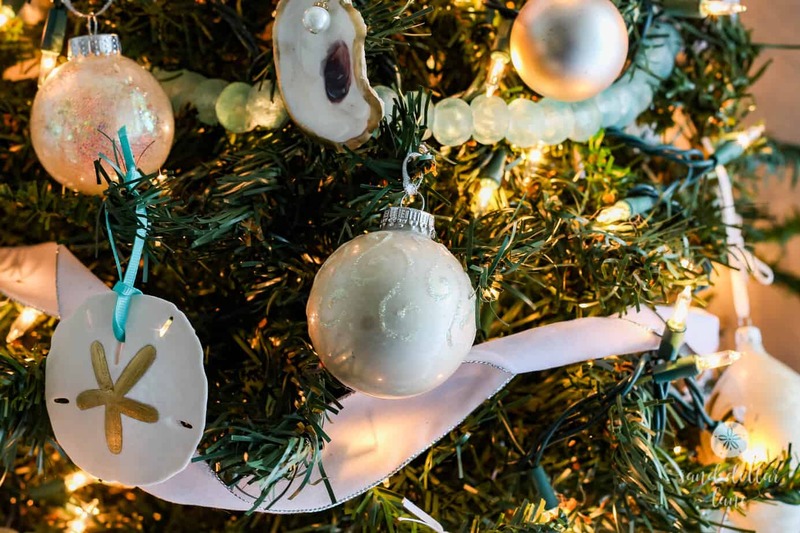 That oyster shell ornament is beautiful! 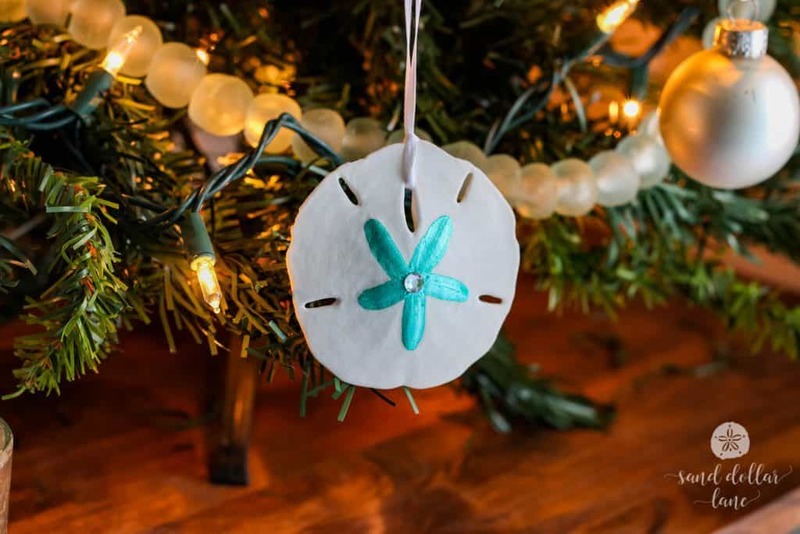 My favorite ornaments would be the sand dollars. Actually everything is beautiful on your tree. Visiting from the blog hop. 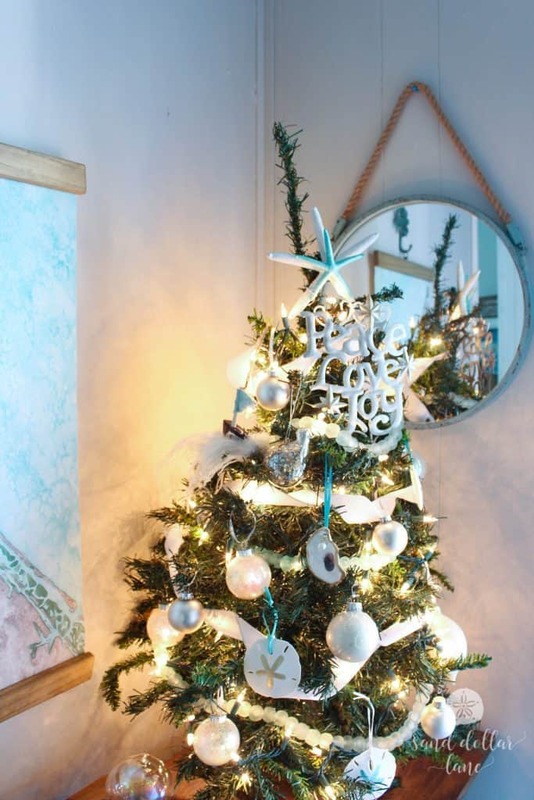 I love, love your aqua coastal tree! It’s so beautiful! 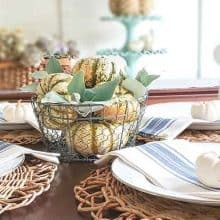 Thank you for sharing with us on this fun blog hop! 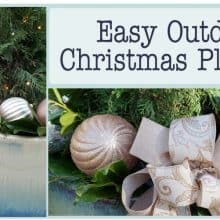 I’ve always wanted to do a coastal tree and yours has so many great ideas. I love the oyster shell ornaments and the glass bead garland. Pinned on my Christmas tree board. Such a pretty and unique tree. This hop has been such fun to find so many beautiful trees.